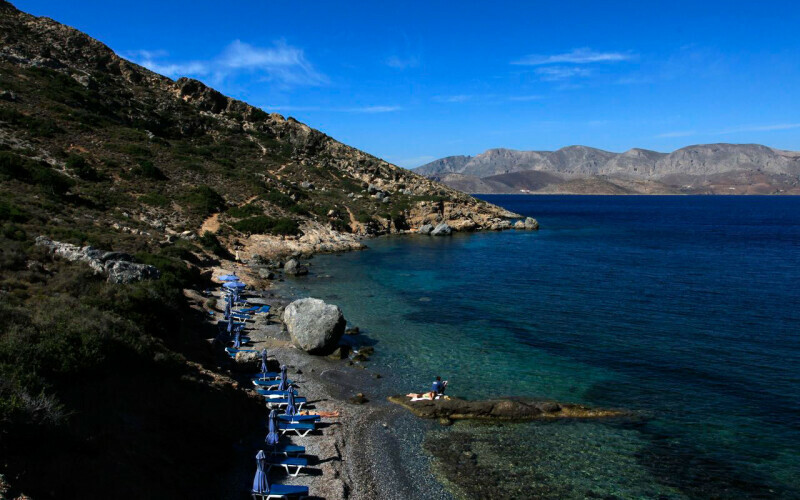 The islet of Telendos, near Kalymnos, rises across the north western coast of Kalymnos, opposite the village of Myrties. Telendos is separated from the main island by a channel just 700 metres wide. 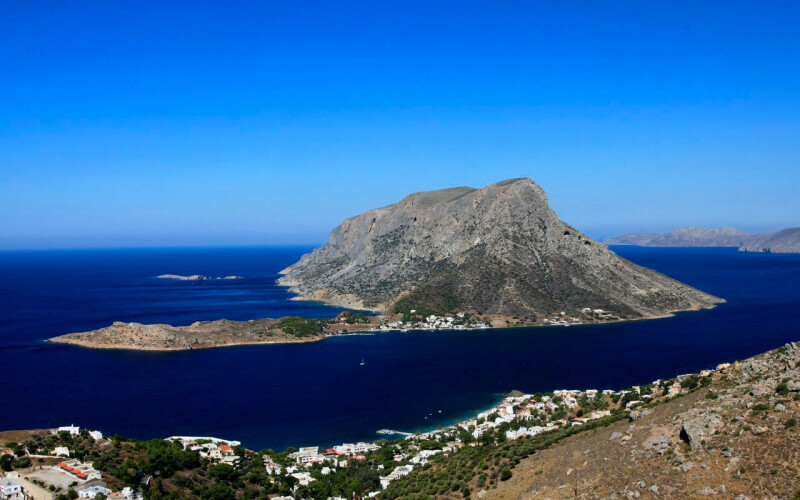 In the ancient times, Telendos was part of Kalymnos, until a massive earthquake in 535 A.D. separated it from the rest of the island. Telendos is rather a barren island. However, its beautiful landscape gives a unique view. Telendos has got very few inhabitants (about 50) and they are all concentrated in a small fishing settlement. Small boats serve the transportation to and from Myrties. They run frequently during the day, carrying passengers for the 10 minutes journey. Telendos does not have any roads, so it is free from traffic and pollution. Telendos has got a tiny port that is usually busy with fishing boats. Alongside the port, you can see a number of taverns and cafes that serve traditional Greek food. 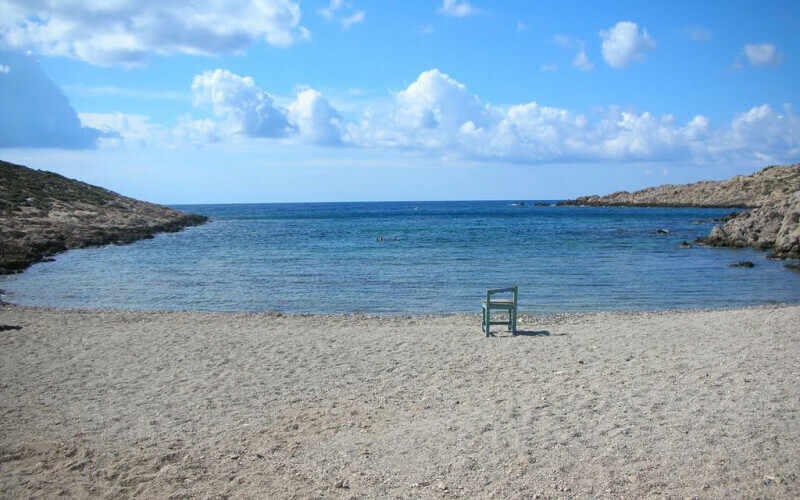 The beaches of Telendos, Paradise and Hoklakas beaches being the most famous, are small and not organized at all, so they are perfect for peace lovers and naturists. The archaeological ruins found at Telendos suggested the existence of a well-organized Christian culture in the 5th and 6th centuries A.D. 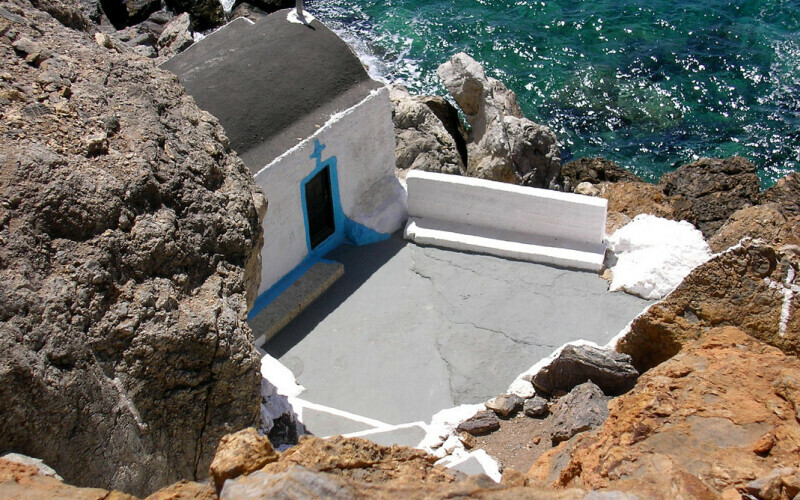 The Early Christian Basilica of Agios Vassilios and the Christian burial ground suggest that the islet once accommodated a wealthy and noble society. The traces of ruined houses, churches and cisterns can be still found there. There is the medieval fortress of Saint Constantine situated a little above the port with nice views to the whole island. Telendos is discovered as soon as you reach Gadouroracho village on top of the hill and you will be stunned by the spectacular panoramic view opening up before your eyes. When you look more closely at the mountain across the water, you will notice that the different rock ledges seem to take the shape of a body resting over the sea with a big face visible looking out from the top of the mountain. There are many versions of the myth of Telendos and how the face was created or what it is really. We are going to give you the most popular version and the one that the people from Telendos believe. The bibliography that was used was taken from Kalymnos library which is named “The Muses”. Specifically, from the book, “Fairytales and Traditions from Kalymnos”, by Mrs. Kapela and Mrs. Zaire, and from the series book, “Kalymnian Years”, we used the stories of Mrs. Mavrou and Vouvali. The most well liked legend is nothing more than another tragic love story like the one of Romeo and Juliet. In the Byzantine years around 1100 to 1200 and when Telendos was already an island and a kingdom of its own, there was a beautiful Princess living there named Pothea. Another kingdom across the channel was that of Castelli, with a small natural castle almost submerged, a little bit further from Mirties, where a Prince Andronicus lived. A very old and deep hatred separated the two ruler families of the channel kingdoms. But, as always, fate plays its own games and Princess Pothea and Prince Andronicus met and fell strongly in love. Very soon after their first contact, Andronicus asked for Pothea’s hand in marriage from her father by sending gifts and the most prestigious matchmakers. The King of Telendos remembered the old hatred and he did not agree to this marriage. Here our story becomes even more blurred. Facts are few, but one thing is for sure: there was a lit candle that needed to be transported across the channel. Perhaps the King had set a challenge for the Prince to swim across the channel to see whether he was worthy of his daughter or perhaps the Princess wanted to send a message of love to the Prince via a lit candle carried on a small board or perhaps even the Princess herself wanted proof that the Prince was in love with her and had asked him to swim from Castelli to Telendos holding a candle. In any case, the candle was not destined to last. The flame would not continue burning against even the lightest breeze. As soon as she saw the flame disappearing, the Princess ran towards the sea and she drowned from sadness that she was not meant to be with her love. On the opposite side of the channel, when the Prince realised that the flame of the candle had died, he preferred to stay in the sea rather than to face a life without his loved one. Since then, the face of the beautiful Princess is marked on the left side of the mountain to remind us that there is love that can live forever. It is said also that the Prince was turned into stone and rests on the bottom of the sea amongst seaweed one mile from Castelli with his eyes open so as he can keep watch forever over the Princess. Here is where our story ends. Maybe the Princess’s profile in the mountain is only a caprice of nature. Maybe the petrified Prince of stone is nothing other than an ancient statue, like the ones that we continue to discover in the sea around our island. The distinction between myth and reality is not clear. It gives us though great strength to believe that a pure heart full of love can engrave a strong big rock, like how our beautiful Telendos is.